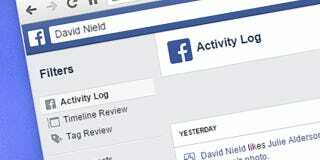 You may not yet have stumbled across the Activity Log page in your wanderings around Facebook, but it’s worth exploring. It provides a blow-by-blow account of everything you do on the social network, and you can use it to take back likes or comments, find your favorite posts again, change your privacy settings and more. To find the Activity Log, click on the drop-down menu on the far righthand side of the toolbar at the top of the interface. You can also get to it by adding “/allactivity” to the end of your Facebook URL (don’t worry, no one else can get to it). Your most recent activity is shown first. You get everything here: likes, event responses, comments, posts, photo tags and all the other comings and goings. Hover over the privacy icon on the right (typically two silhouette portrait shapes) to check who can view the content in question—if it’s one of your own posts, you have the option to change the visibility of it. Click on the pencil icon to the right of each activity entry to take it back and erase it from the Facebook universe. It’s possible to delete posts and comments, unlike posts from other people, hide certain updates from your profile (like the acceptance of an event invite) and more besides.